The Troutdale, VA area has had 3 reports of on-the-ground hail by trained spotters, and has been under severe weather warnings 11 times during the past 12 months. Doppler radar has detected hail at or near Troutdale, VA on 15 occasions. 4/19/2019 11:32 AM EDT At 1131 am edt, a bowing line of severe thunderstorms were located from whitetop to near lansing to west jefferson, moving northeast at 35 mph (radar indicated). Hazards include 60 mph wind gusts and quarter size hail. Hail damage to vehicles is expected. Expect wind damage to roofs, siding, and trees. 11/6/2018 7:27 AM EST The severe thunderstorm warning for northwestern alleghany. 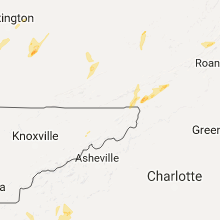 watauga and ashe counties in northwestern north carolina. 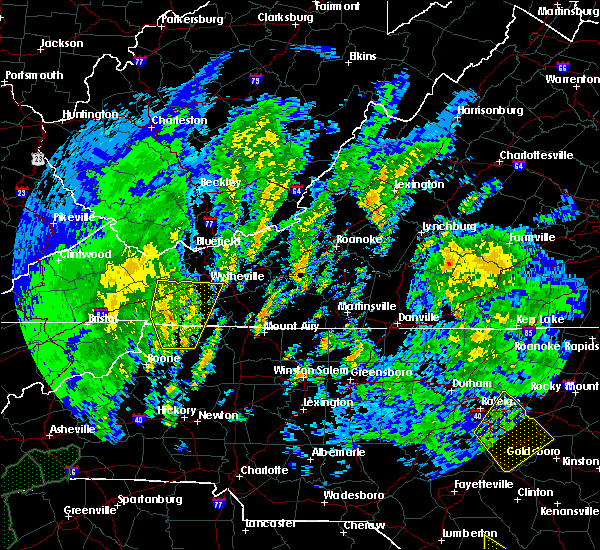 southeastern smyth and western grayson counties in southwestern virginia will expire at 730 am est. The storms which prompted the warning have weakened below severe limits, and no longer pose an immediate threat to life or property. 7/6/2018 12:26 PM EDT The severe thunderstorm warning for southern smyth and west central grayson counties will expire at 1230 pm edt, the severe thunderstorm which prompted the warning has weakened. therefore, the warning will be allowed to expire. when it is safe to do so, please send your reports of hail of any size, as well as reports of any wind damage, including downed trees or large limbs, to the national weather service by calling toll free at 1, 8 6 6, 2 1 5, 4 3 2 4. reports and pictures can also be shared on the national weather service blacksburg facebook page and on twitter. 7/6/2018 12:06 PM EDT At 1206 pm edt, a severe thunderstorm was located over adwolf, moving southeast at 20 mph (radar indicated). Hazards include quarter size hail. Damage to vehicles is expected. Locations impacted include, marion, chilhowie, sugar grove, troutdale, and adwolf. 7/6/2018 11:47 AM EDT At 1147 am edt, a severe thunderstorm was located near broadford, moving southeast at 20 mph (radar indicated). Hazards include 70 mph wind gusts and ping pong ball size hail. People and animals outdoors will be injured. expect hail damage to roofs, siding, windows, and vehicles. expect considerable tree damage. Wind damage is also likely to mobile homes, roofs, and outbuildings. 6/17/2018 6:28 PM EDT At 626 pm edt, a severe thunderstorm was located near flatridge, drifting west at 5 mph or less (radar indicated). Hazards include 60 mph wind gusts. Expect damage to roofs, siding, and trees. Locations impacted include, mouth of wilson, troutdale, volney, and rugby. 5/27/2017 8:22 PM EDT The severe thunderstorm warning for alleghany and ashe counties in northwestern north carolina, southeastern smyth and western grayson counties in southwestern virginia will expire at 830 pm edt, the storm which prompted the warning has weakened below severe limits, and no longer poses an immediate threat to life or property. therefore the warning will be allowed to expire. a severe thunderstorm watch remains in effect until 200 am edt for northwestern north carolina, and southwestern virginia. when it is safe to do so, please send your reports of hail of any size, as well as reports of any wind damage, including downed trees or large limbs, to the national weather service by calling toll free at 1, 8 6 6, 2 1 5, 4 3 2 4. reports and pictures can also be shared on the national weather service blacksburg facebook page and on twitter. 5/27/2017 7:55 PM EDT At 754 pm edt, a severe thunderstorm was located over rugby, moving southeast at 15 mph. a second strong thunderstorms was just north of bridle creek moving south at 25 mph (radar indicated). Hazards include 60 mph wind gusts and quarter size hail. Hail damage to vehicles is expected. expect wind damage to roofs, siding, and trees. Locations impacted include, sparta, jefferson, west jefferson, independence, and lansing. 5/27/2017 7:32 PM EDT At 732 pm edt, a severe thunderstorm was located over troutdale, moving southeast at 20 mph (radar indicated). Hazards include 60 mph wind gusts and quarter size hail. Hail damage to vehicles is expected. Expect wind damage to roofs, siding, and trees. 5/9/2017 7:07 PM EDT The severe thunderstorm warning for northwestern alleghany and ashe counties in northwestern north carolina, south central smyth and southwestern grayson counties in southwestern virginia will expire at 715 pm edt, the storms that prompted the warning have weakened below severe limits, and no longer pose an immediate threat to life or property. therefore the warning will be allowed to expire. however gusty winds and heavy rain are still possible with these thunderstorms. when it is safe to do so, please send your reports of hail of any size, as well as reports of any wind damage, including downed trees or large limbs, to the national weather service by calling toll free at 1, 8 6 6, 2 1 5, 4 3 2 4. reports and pictures can also be shared on the national weather service blacksburg facebook page and on twitter. 5/9/2017 7:07 PM EDT At 646 pm edt, a severe thunderstorm was located near grassy creek, moving southeast at 35 mph. another possible severe thunderstorm will cross whitetop around 7 pm (radar indicated). Hazards include 60 mph wind gusts and quarter size hail. Minor damage to vehicles is possible. expect wind damage to trees and power lines. Locations impacted include, jefferson, west jefferson, lansing, mouth of wilson, and glendale springs. 5/9/2017 6:47 PM EDT At 646 pm edt, a severe thunderstorm was located near grassy creek, moving southeast at 35 mph. another possible severe thunderstorm will cross whitetop around 7 pm (radar indicated). Hazards include 60 mph wind gusts and quarter size hail. Minor damage to vehicles is possible. expect wind damage to trees and power lines. Locations impacted include, jefferson, west jefferson, lansing, mouth of wilson, and glendale springs. 5/9/2017 6:31 PM EDT At 630 pm edt, a severe thunderstorm was located near nella, moving southeast at 40 mph. another possible severe thunderstorm was also just west of whitetop and will affect western grayson county by 7 pm (radar indicated). Hazards include 60 mph wind gusts and quarter size hail. Minor damage to vehicles is possible. expect wind damage to trees and power lines. Locations impacted include, jefferson, west jefferson, lansing, mouth of wilson, and glendale springs. 7/4/2016 9:32 PM EDT At 932 pm edt, severe thunderstorms were located along a line extending from near adwolf to near whitetop to near flatwood, moving southeast at 40 mph (radar indicated). Hazards include 60 mph wind gusts. Expect damage to roofs. siding. And trees. 6/23/2016 9:17 PM EDT At 916 pm edt, severe thunderstorms were located along a line extending from near kimberling to sugar grove, moving east at 50 mph (radar indicated). Hazards include 60 mph wind gusts. Expect damage to roofs. siding. and trees. Locations impacted include, wytheville, bland, marion, chilhowie, and rural retreat. 6/23/2016 8:51 PM EDT At 850 pm edt, severe thunderstorms were located along a line extending from near boissevain to quarry, moving east at 50 mph (radar indicated). Hazards include 60 mph wind gusts. Expect damage to roofs. siding. And trees. 6/21/2016 6:57 PM EDT The severe thunderstorm warning for northwestern grayson, tazewell, smyth, southwestern wythe and southwestern bland counties will expire at 700 pm edt, the storm which prompted the warning has weakened below severe limits, and no longer poses an immediate threat to life or property. therefore the warning will be allowed to expire. however gusty winds and heavy rain are still possible with this thunderstorm. 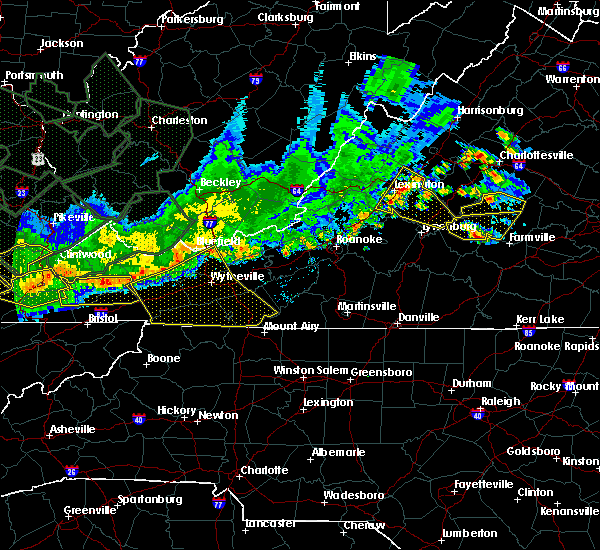 a severe thunderstorm watch remains in effect until 1000 pm edt for virginia and west virginia. when it is safe to do so, please send your reports of hail of any size, as well as any reports of wind damage, including downed trees or large limbs, to the national weather service by calling toll free at 1, 8 6 6, 2 1 5, 4 3 2 4. reports and pictures can also be shared on the national weather service blacksburg facebook page and on twitter. 6/21/2016 6:22 PM EDT At 621 pm edt, a severe thunderstorm was located over cliffield, moving southeast at 35 mph (radar indicated). Hazards include 60 mph wind gusts and quarter size hail. Hail damage to vehicles is expected. expect wind damage to roofs, siding, and trees. Locations impacted include, marion, richlands, tazewell, saltville, and chilhowie. 6/21/2016 6:06 PM EDT At 605 pm edt, a severe thunderstorm was located over glen burke, moving southeast at 40 mph (radar indicated). Hazards include 60 mph wind gusts and quarter size hail. Hail damage to vehicles is expected. Expect wind damage to roofs, siding, and trees. 6/16/2016 10:28 PM EDT The severe thunderstorm warning for central grayson, smyth, wythe and northwestern carroll counties will expire at 1030 pm edt, the storms which prompted the warning have weakened below severe limits, and no longer pose an immediate threat to life or property. therefore the warning will be allowed to expire. however gusty winds to 45 mph along with small hail and heavy rainfall will continue. when it is safe to do so, please send your reports of hail of any size, as well as any reports of wind damage, including downed trees or large limbs, to the national weather service by calling toll free at 1, 8 6 6, 2 1 5, 4 3 2 4. reports and pictures can also be shared on the national weather service blacksburg facebook page and on twitter. 6/16/2016 10:06 PM EDT At 1006 pm edt, severe thunderstorms were located along a line extending from near coleman store to near mount rogers national recreation area to near broadford, moving southeast at 40 mph (radar indicated). Hazards include 60 mph wind gusts. Expect damage to roofs. siding. and trees. Locations impacted include, wytheville, marion, saltville, chilhowie, and rural retreat. 6/16/2016 9:39 PM EDT At 937 pm edt, severe thunderstorms were located along a line extending from near favonia to asberrys to raven, moving southeast at 40 mph. these storms will drop through the region with damaging winds in the next hour (radar indicated). Hazards include 60 mph wind gusts. Expect damage to roofs. siding. And trees. 7/14/2015 9:04 PM EDT At 902 pm edt, a line of severe thunderstorms was located across parts of smyth, wythe and bland counties, moving southeast at 45 mph (radar indicated). Hazards include 60 mph wind gusts. Expect damage to roofs. siding and trees. Locations impacted include, wytheville, galax, bland, marion, and hillsville. 7/14/2015 8:50 PM EDT At 849 pm edt, a line of severe thunderstorms was located over tazewell and bland counties, moving southeast at 45 mph (radar indicated). Hazards include 60 mph wind gusts. Expect damage to roofs. Siding and trees. 7/13/2015 6:52 PM EDT The national weather service in blacksburg has issued a * severe thunderstorm warning for. 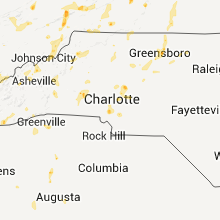 ashe county in northwestern north carolina. watauga county in northwestern north carolina. 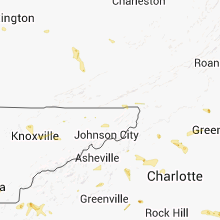 alleghany county in northwestern north carolina. Grayson county in southwestern virginia. 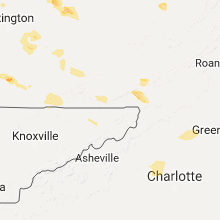 6/8/2015 6:49 PM EDT At 647 pm edt, severe thunderstorms were located along a line extending from tiptop virginia, to 8 miles northwest of whitetop, moving east at 40 mph (radar indicated). Hazards include 60 mph wind gusts. Expect damage to roofs. siding and trees. Locations impacted include, marion, bluefield, tazewell, saltville, chilhowie and mount rogers. 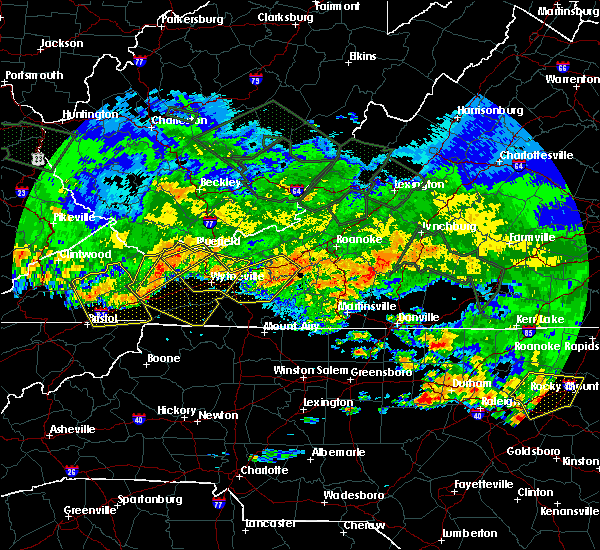 6/8/2015 6:32 PM EDT At 630 pm edt, severe thunderstorms were located along a line extending from near tazewell, to south of abingdon, moving east at 40 mph (radar indicated). Hazards include 60 mph wind gusts. Expect damage to roofs. siding and trees. Locations impacted include, marion, richlands, bluefield, tazewell, saltville chilhowie and mount rogers. 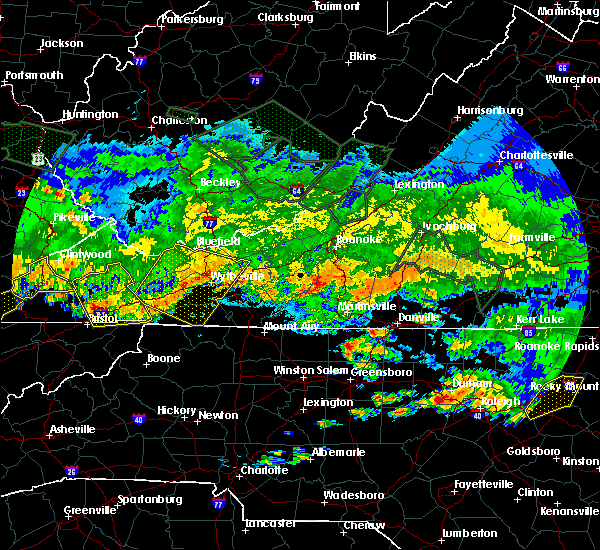 6/8/2015 6:09 PM EDT At 606 pm edt, severe thunderstorms were located along a line extending from near richlands to bristol virginia, moving east at 35 mph (radar indicated). Hazards include 60 mph wind gusts. Expect damage to roofs. Siding and trees.